Climate Lessons: Wind-Subsidy Farms Cause Loss to Society - one result of the ill-informed panic about rising CO2 levels in the air. Wind-Subsidy Farms Cause Loss to Society - one result of the ill-informed panic about rising CO2 levels in the air. 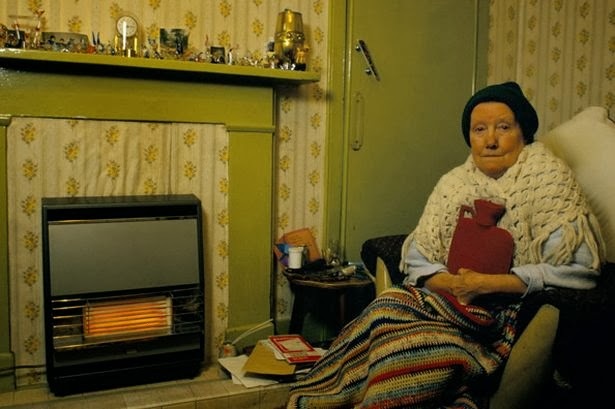 '8,000 people die in the UK every year due to what is being called "Fuel Poverty". Fuel Poverty is a trendy term for those who can't afford to heat their home because all the solar panels and windmills, the coal bans and the wars on fracking have made it too expensive for people not to freeze to death..
'Onshore wind farms are being paid £30 million a year to sit idle during the windiest weather. Whether their blades are turning or not, these wind-subsidy farms are devices for transferring money from the bulk of the population to the relatively rich handful of owners and operators. In exchange, the people get higher electricity bills, defaced landscapes, and lost opportunities in a less economically competent society. These are not the greatest of the harms caused so far by the pushers of climate alarm, but they are nevertheless appreciable and getting worse by the month. And the further harm that the pushers, and the children of the climate scare could cause scarcely bears thinking about, but think about it we must. Loschmidt was the brilliant 19th century physicist who was the first in the world to successfully estimate the size of air molecules - within a factor of 2 or so anyway. We can assume Loschmidt thought about what those molecules did, and, with the knowledge of the fact that gas molecules were far smaller than the space between them, the world saw the beginning of Kinetic Theory being applied to "ideal" gases with documented assumptions that I encourage you all to read, because Kinetic Theory was successfully used by Einstein and others, and from it we can derive the well known ideal gas laws. We can also derive (in just two lines) the magnitude of the so-called dry adiabatic lapse rate without using those gas laws or any pressure data. It's not hard to visualise what Loschmidt did, namely molecules moving around at random and colliding with others rather like billiard balls. When they collide they share their kinetic energy, and as a result, we see diffusion of kinetic energy which results in a tendency towards equal temperatures in a horizontal plane. We have all observed such diffusion in our homes when warmth from a heater spreads across the room. But, when those molecules move in free frictionless flight between collisions the assumptions of kinetic theory include the "classical treatment" of their dynamics, noting that "because they have mass the gas molecules will be affected by gravity." And so Newtonian mechanics tell us that the sum of kinetic energy and gravitational potential energy remains constant. But, as a gas spontaneously approaches thermodynamic equilibrium it is approaching a state in which there are no unbalanced energy potentials. That state is isentropic, having (PE+KE)=constant at all heights, and this means that KE varies and, as Kinetic Theory tells us, temperature also varies in proportion to the mean kinetic energy of the molecules. It does not matter that the final state is never completely materialised, and so entropy will still be increasing. We are considering what happens as we approach a limit, just as in calculus. Entropy will keep increasing until that limit is achieved, but it never is because, with a new day dawning more solar energy is added causing a significant disturbance to the process and moving it further away from equilibrium. Never-the-less, by the following night if there are calm conditions, the state of thermodynamic equilibrium will again be approached. Over the life of the planet the temperature gradient has obviously evolved on all planets with significant atmospheres, and it also occurs in sub-surface regions such as Earth's outer crust and inside the Moon. The empirical evidence is that Loschmidt was right and that Maxwell erred on just this particular issue wherein molecular studies were perhaps not his specialty. The huge significance of this is that there is no need for any greenhouse radiative forcing to explain planetary atmospheric and surface temperatures. These cannot be explained at all by radiation calculations - only by the gravity gradient. The trillion dollar question is thus, was Loschmidt right?